This thesis builds a case for the significance of the regional shopping center—the mall—within the context of postwar American suburbs. Through an analysis of its history, design and the culture it created, the role of the mall within the greater landscape of suburban development arises as a critical component within the social and architectural systems of suburbia. During an era when the suburban development was exploding prewar concepts of what defined a 'suburb', the regional mall arose as a centralizing force within the sprawl. As a new building type, the mall was designed as a civic and commercial center, a place where social life could convene and flourish. Plans and speeches from mall designers were full of idealistic rhetoric yet the mall's overwhelming success proved its necessity. It was the public's response to the mall that allowed it to achieve its idealistic goals and take its place a suburban center. This role within the larger historic framework of the suburbs has been underplayed and as a result, many historic malls are being demolished or severely changed without any discussion of their significance. 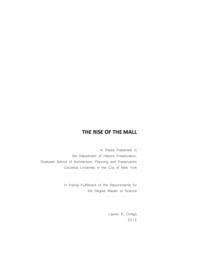 This thesis discusses the possible futures of historic malls and the challenges they face that prevent many from the wrecking ball. The mall's past as a civic and social center for suburban life defines its significance for preservation today. The reincarnation of this role is also that which can save the mall and define a new future for this unique suburban building.